UAE – Ride in an ancient water taxi to the gold and silver souks of Dubai. Ethiopia – Visit the fascinating tribal villages of Ethiopia. Rwanda – Trek up the slopes of the mighty Virungas in search of Golden Monkeys and Mountain Gorillas. Botswana – Discover the giant baobab trees and 1,500 year old rock paintings of Chobe National Park. South Africa – Seek out the Big Five and the elusive Black Rhino on wildlife drives and bush walks. Arrive at Abu Dhabi Airport and enjoy VIP Fastrack formalities and transfer to your opulent suite at the palatial hotel in the heart of the city. Drive the corniche and visit the impressive Sheikh Zayed Mosque; observe traditional Arabian life at the Heritage Village; visit the Louvre and Guggenheim Museums; and take a private sunset cruise. Spend a day in Dubai and chat with locals, ride an ancient water taxi to the gold and silver souks. 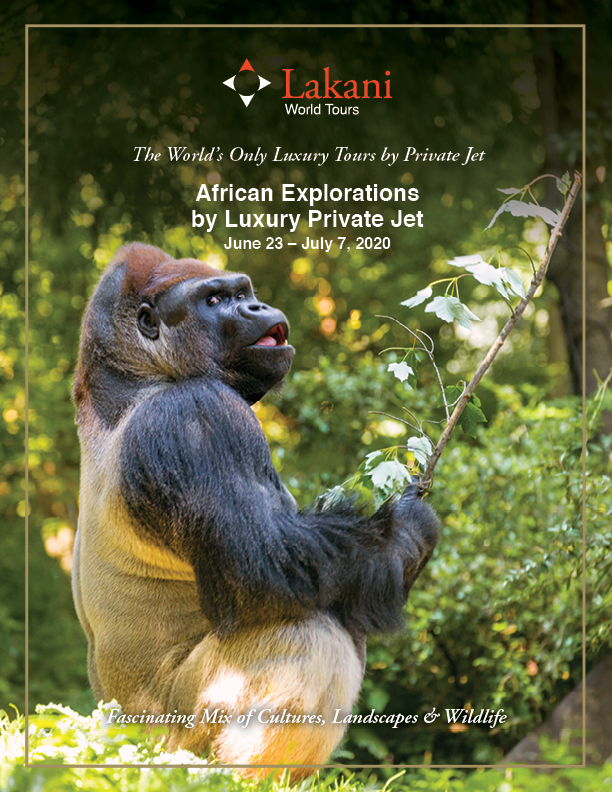 Climb aboard the Lakani Private Jet and head to the African continent and your suite accommodations in the center of Ethiopia’s capital city. Visit Ethiopia’s fascinating tribal villages and learn about their culture. Tour historic Addis Ababa and visit the Ethnological Museum in Emperor Haile Selassie’s former palace. Fly to Rwanda where your luxury lodge is situated in the foothills of the mighty Virungas, home to over 20 families of Mountain Gorilla. Trek up the slopes to see the magnificent gorillas and sit among them as they go about their daily lives. Visit the Golden Monkeys, and get a glimpse into rural Rwandan life on a tour of the local fields and villages. Travel by Lakani Private Jet and charter to your sumptuous tented suite outfitted with a fabulous deck and view of the Savute Channel, where elephants love to play and bathe. Venture out on game drives to view the prolific wildlife in Chobe. Discover the 1,500-year-old rock paintings by the San (Bushmen), giant baobab trees, and a wide variety of birdlife. Finish the day with stargazing into the pristine African skies. Fly by private charter and Lakani Jet to KwaZulu-Natal. Your luxury suite with private plunge pool and deck overlooking the vlei with unforgettable views of animals parading by; seek out the Big Five on wildlife drives and bush walks; enjoy encounters with the Zulu people; and participate in Black Rhino tracking and conservation. Bid farewell to the African bush and your newfound friends as you board your charter plane to Johannesburg, where you will have an opportunity to refresh and repack in your reserved room at the Intercontinental Hotel before your departure home.